Renal Nursing is a comprehensive evidence-based guide to nursing in the field of nephrology and kidney care. This fully updated fourth edition discusses the stages of chronic kidney disease, prevention and early management, pre-dialysis care, haemodialysis and peritoneal dialysis, transplantation, investigations and nutrition. It also includes key information on renal care in infancy, childhood and early adolescence. The underlying anatomy, physiology and psychology of kidney disease are reviewed in depth, along with the skills and knowledge required to provide support, treatment and high-quality care. Special features: * Fully grounded in the NHS National Service Framework for renal services * New chapter on patient involvement in renal care * Content and references fully updated to reflect changes in policies, evidence, care and management * Begins with the basics and covers all the vital material required by anyone working in renal care Renal Nursing is an ideal reference text for nurses undertaking post-registration renal courses, student nurses undertaking a placement in a renal ward, specialist renal dietitians, pharmacists and other professions allied to medicine. Renal Nursing is a comprehensive evidence-based guide to nursing in the field of nephrology and kidney care. This fully updated fourth edition discusses the stages of chronic kidney disease, prevention and early management, pre-dialysis care, haemodialysis and peritoneal dialysis, transplantation, investigations and nutrition. It also includes key information on renal care in infancy, childhood and early adolescence. The underlying anatomy, physiology and psychology of kidney disease are reviewed in depth, along with key skills and knowledge required to provide support, treatment and high-quality care. 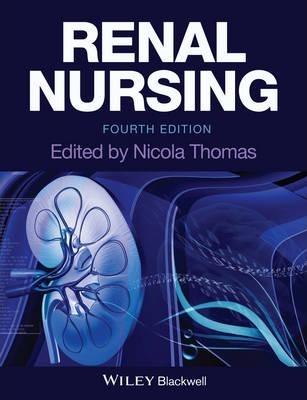 Renal Nursing is an ideal reference text for nurses undertaking post-registration renal courses, student nurses undertaking a placement in a renal ward, specialist renal dieticians, pharmacists and other professions allied to medicine. Dr Nicola Thomas is an independent renal nursing consultant and senior lecturer at London South Bank University, London, UK.